Thoughts hounded. Memories flashed. Things from the past held on too tightly. Mistakes often linger…in our minds…in our hearts. Events from yesterday shift into our present day, never allowing us the freedom to fully move forward. Living under the weight of the “should have’s” is a heavy burden to carry. And sometimes the hardest person to forgive, is the one staring back at us in the mirror. Labels attach themselves securely to our souls, not to be easily removed. You know the ones – that cling, and seem to follow us, wherever we go. The ones we try to forget. The ones that raise their ugly heads at unexpected moments, reminders of where we’ve come from. Shame. Rejected. Fearful. Anxious. Addicted. Adulterous. Depressed. Unstable. Sick. Weak. Lonely. Failure. Abused. Neglected. Victim. Forgotten. Guilt-ridden. Mistake. Defeated. Confused. Broken. Hopeless. 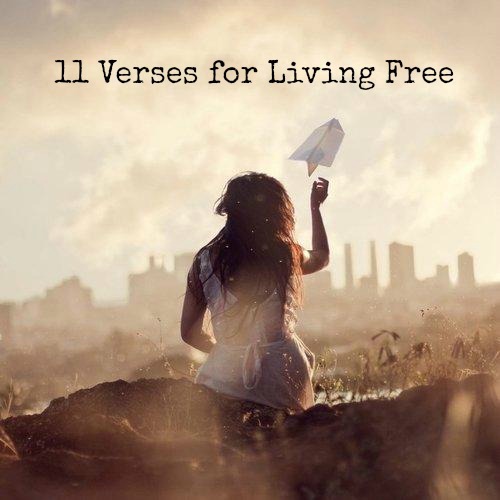 Though we know the truth, that we’ve been set free in Christ, some labels are written in an ink that seems almost permanent, not easily washed away by a good thought, encouraging word, or a well-intentioned verse. They stick, like super glue, adhering to our personhood. An open door for the enemy’s voice to whisper lies deep down to our souls. “Remember, who you are,” his condemning voice hisses, heaping on more shame and guilt. “Remember where you’ve come from, remember what you’ve done. You’ll never change, you’ll never be any different.” Crafty, master deceiver of lies, whose constant goal is to remind us of every failure and every negative label that has ever attached itself to our lives. We know the truth. We know not to listen to the lies. And yet too often, we slowly…swallow…every…one. And so the labels remain. We find ourselves wallowing there. In yesterday. Its memories cling to us and won’t let go. So we carry it all with us wherever we go. It becomes a part of who we are, it affects our decisions and shapes our future. Many days it controls us, our emotions, our temperaments, or how we respond to various situations. Sometimes we even cover our past labels with more “acceptable” labels. Once called “rejected” may become forever “ independent,” vowing to never need anyone again. Once “ashamed” may become “proud,” unwilling to show any sign of weakness. But underneath it all, there still remains a needy soul, longing for healing, for freedom. Covering over what’s really there. We don’t have to live that way. These labels that attempt to define us, either stuck there by life circumstances, struggles, misinformed people, or even ourselves, are not permanent. The labels and mistakes of our past do not determine the reality of our future. His label over you is lasting. It sticks. It’s permanent. It doesn’t wash off if you blow it again. It doesn’t fade over time if you’re not consistent. It breathes new hope, gives another chance, believes for the best, and offers a fresh start. Again. And again. Over and over. Breaking up with our past, does not mean to ignore it. Removing sticky labels doesn’t mean we pretend that the pain never happened. It is what it is. It’s shaped who we are today. It just means we won’t allow it to control us anymore. We can learn from our pasts, we can heal from the struggles, we can believe that God will somehow use it all for good, to help another soul. But we don’t have to stay stuck there. It does not need to determine our tomorrow. If we’re still bound up with hurtful memories, we are never fully free to move forward. There is more for you, on the other side of your past. If you woke up this morning, you’re still living and breathing, and that means God has purpose in store. We will never be able to fully embrace all that He has for us in life today, and for the future, if we can’t let go of the things from yesterday. And so, I am making the choice. I’m breaking up with my past. I will not allow it to rule my thoughts. I won’t let it dictate my future. I will choose to let the power of Christ remove the old labels. I will choose to move forward. I will choose to live free. So what about you? What’s that thing, the sticky old label, that you can choose to let go of today? He has good in store. Thank you. I appreciate reading what you write about. I’ve enjoyed several of your recent articles! I love reading your posts, this one means a lot to me. I identified with everything you said. Thanks a lot. l think we all need to align with you in this. YOU are Spot-On about your leading others out of black holes from their past. It’s a mind-shift from focusing on the past to remembering His forgiveness and our choices in the future to keep His Word close to us. Thanking God for your ministry. This helps me a lot today, Debbie. Thank you! Woke up this Good Friday morning, reflecting my past choices, knowing my forgiveness in Him, and yet I think; ok I’m forgiven. But how does that change my circumstances? My failures resulted in heavy consequences that I’m not sure there’s ever resurrection from. I know in my heart that love wins. And I will keep pushing forward. Thank you for this article Debbie, It is exactly what I needed to read. I am stubborn, and have held unto much of my past in wrong decisions I made in my life. I will not let the enemy steal my happiness anymore. I will let the power of God remove the old labels. I will be set free! Thankyou again for the powerful words from JESUS. Love in Christ.